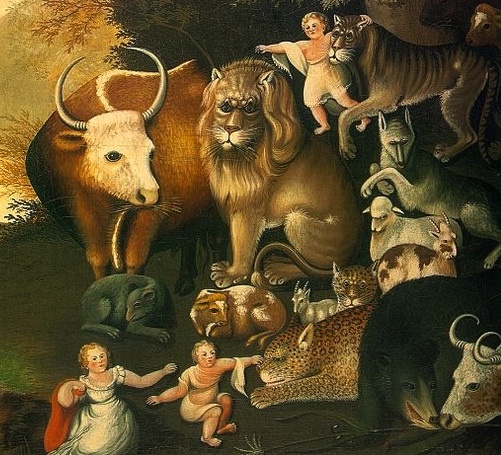 I picked Edward Hicks’s Peaceable Kingdom (c.1834) for another reason too, being that at 11:00 a.m. CET, 9:00 a.m. GMT tomorrow the Nobel Peace Prize is announced. Of all the awards handed out annually by the Nobel Foundation (outstanding achievements in physics, chemistry, medicine, literature and peace) I reckon the latter causes the most clatter and interest. But back to Hicks and his picture at the NGA, of which he made many and myriad versions. Hicks (1780 – 1849) was an American folk painter (of little or no official training) who was also a distinguished minister of the Society of Friends. Indeed, he became a bit of a Quaker icon because of paintings like this one, in which he processes and presents palatable and moral messages to his congregation of spectators. Here in an Edenic forest is a throng of beasts great and small all hanging out together, natural adversaries that now show nary a thought to eating, beating or treating one another badly. The lion doth sit with the calf, the bear doth nuzzle with the cow and (to stress the lesson), kiddies caper amongst and caress the animals without apprehension. 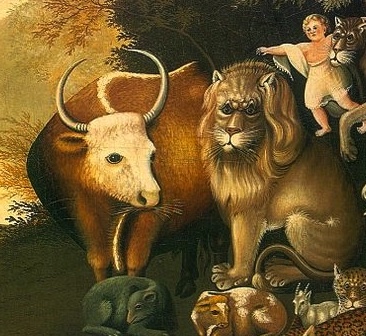 This scene of course is inspired by a passage in Isaiah (“The wolf shall dwell with the lamb, and the leopard shall lie down with the young goat, and the calf and the lion and the fattened calf together; and a little child shall lead them”), but Hicks has enhanced it with another story in the distance. 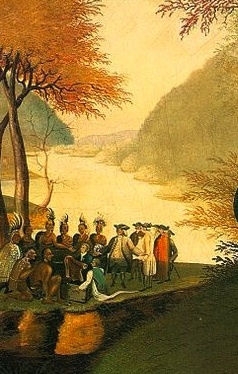 There we see William Penn with the Indians, a meeting that had been documented only anecdotally, but which by Hicks’s day had reached mythic proportions. Hicks obviously had ideas about pertinent parallels between the two scenes, which is why he brings them into a single composition. Hicks is all about preaching the peace, which makes him a favorite and forerunner in my own NGA-based Peace Prize. He didn’t abolish or reduce any standing armies or hold or promote any peace congresses. But he did stick true – through tens of versions of his Peaceable Kingdom – to his personal conviction that fraternity between nations was pressingly important and probably possible. adorable ad, effect heightened by the upbeat tune….what a wonderful painting, too! 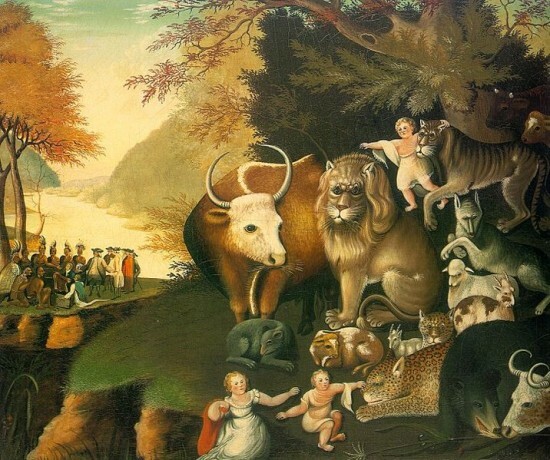 i can imagine children can look at this for hours, naming all the animals congregated in one idyllic scene! Great post! Off to check who won the Peace Prize now….